World leaders pose for the cameras in Paris. Public domain.One can be proud of the chain of solidaristic reactions that emerged in defence of freedom of expression and of the press after the January 7-8 Paris attacks. This sense of pride, however, should not prevent us from looking more closely at the apparent forms of unanimity that were displayed during the massive demonstrations of January 11. It is our role as citizens to assess the political reactions the attacks triggered and the responses the tragedy prompted. The politics of unanimity all too often erects a folding screen for paranoid politics, predictive logics and generalised suspicion. It is high time to oppose these taken-for-granted logics with the reintroduction of a more critical and sociological reflexivity. More than three million people took part in unity marches across France on January 11, and more than 40 world leaders joined the start of the Paris march, linking arms in an act of solidarity. An early form of unanimity displayed in those demonstrations evolved around the defence of a culturally enshrined form of secularism. This solidarity drive, however, gradually lost its strength and inevitably raised debates not only in France but everywhere in the world (including in openDemocracy columns) about the content of Charlie Hebdo and the singular French concept of laicité. The ambiguities of ‘Je suis Charlie’ certainly merit further analysis at some future point. What we can say however, is that whatever its ambivalence, this first response is clearly distinct from the unanimity displayed by the world leaders’ coalition. Who is this ‘we’ who led the procession and spoke in our names? Despite the efforts of the media to describe the upsurge of solidarity as a unique and moving example of popular and diplomatic consensus, the way in which decisive political negotiations were planned straight after the attacks clearly suggest that quite a number of political leaders gathering in Paris seized the opportunity to push specific agendas in the field of counterterrorism. This second form that unanimity took is equally ambivalent. Behind the scenes, there are four distinct conceptions of what antiterrorism should be that are at stake here. The first is linked to the Schmittian state of exception, i.e. as a capacity of the sovereign to transcend the rule of law in the name of the public good. What was implemented in the US after 9/11 – the Patriot Act - is exactly that: a series of emergency measures that gave full authority to the executive. The Obama administration, by making some adjustments to this state of exception and showing more restraint, softened the most problematic contours of the Patriot Act, without dramatically changing, however, an overall perspective on global counterterrorism. These adjustments to the state of exception doctrine signal a second conception of antiterrorism which can be found at the transatlantic and at the European level. This version is not as extreme as the state of exception, but does not prevent the use of exception in ordinary laws. Furthermore, it does share with the first conception a common view about what is at play: a globalised vision of a long-term conflict between “them” – ‘the terrorists’ – and “us” – the democracies. Here, a geostrategic view of the world is being enacted, in which local clandestine actors are interconnected and allied against us. Therefore, fundamental rights have to adjust to these uncertain times and become flexible: securing our world should come first. A third conception can be identified, which does not share these globalized views of the world and its manifestations of violence. This conception gives more importance to the local environment and focuses more on ordinary criminals who become ideologically radicalised. According to this account, the threat is more likely to be found in the relationships between petty crimes and banditry, between criminality and the prison world. In that view, fundamental rights and civil liberties are not necessarily suspended; they should be adapted on a case-by-case basis but primarily according to law enforcement needs and requirements. These three first conceptions are often combined, despite their diverging narratives, in one shared assumption: that the security/liberty equilibrium cannot stand as it is and prevention must be sought through surveillance techniques. They also share a common viewpoint: that too much scrutiny would be a severe impediment to the efficiency of antiterrorism. A fourth conception is clearly at odds with these understandings of what terrorism is and what counterterrorism should be. This conception understands terrorism as a violence emerging from rather small groups of actors. An escalation of repressive measures is thus far more dangerous than limited propagandising around the deed. Security logics should always respect fundamental rights and the latter must not be weakened by counterproductive construction of an enemy with more powers and support than the reality suggests. These conceptions have many respective implications in terms of public policies. The two first approaches regard large-scale surveillance at the transnational level as possessing every virtue. Intelligence gathering and sharing at a global scale is here perceived as the only way to profile, anticipate, prevent and counter. Such views are shared among intelligence services, who constantly ask for more power (i.e., with fewer judicial constraints such as individualised search warrants), for more intrusive means (online surveillance, access to private companies’ data, as an addition to traditional investigative techniques such as wire tapping or CCTV) to detect, identify, protect. The approach that favours a “gangsterisation” of terrorism justifies police infiltration and an in-depth knowledge of the terrain (the milieu). Its proponents do not advocate for a largescale surveillance and prefer to concentrate their surveillance resources on identified suspects. However, despite real differences, they are often combined, as if they were coherent and perceived as equally efficient. This is particularly evident at the European level, which is strongly influenced by a counterterrorism agenda promoted by successive US administrations, as detailed hereafter. The last conception that insists on the need to protect liberties and Fundamental Rights relies much more on a judicial form of reasoning which aims at countering security excess by setting up more efficient oversight bodies, by implementing further real time scrutiny of police operations and advocating for more accountability of intelligence services. What transpires in measures presented at domestic levels across the world, at the transatlantic and at the European level is de facto a tension between the three first conceptions. The last option, even if highly pertinent, has too often been marginalised and perceived as the hobgoblin of human rightists. Most of the announcements heard after the attacks echoed a well-known repertoir: the best response to the tragedy is a draconian increase in counterterrorism measures and a reinforcement of transnational intelligence cooperation. Intelligence: mould and mother of all the virtues? The mobilisation that arose in the aftermath of the January Paris attacks gave a first-class boost to old debates and recycled measures that have previously encountered considerable political resistance. Instead of stepping back and analysing what actually happened in Paris, most political actors would rather focus on what is supposed to matter: the enhancement and reinforcement of intelligence gathering and sharing at the international level. Of significant importance here is the EU passenger name record (PNR) debate. Unsurprisingly, a meeting on the EU PNR system has been planned, despite political deadlock at the European Parliament. At the heart of this well-disputed proposition aimed at complementing US PNR and promoting transatlantic intelligence sharing, lie the two conceptions described earlier that apprehend counterterrorism solely from the perspective of intelligence gathering. The European Parliament, despite its legitimate concerns over the EU PNR, is immediately billed as a political opponent, the ones who prevent intelligence services from doing their work for the common good. The current context leaves little hope for proponents of the protection of our privacy and civil liberties, despite isolated warnings from EU highranking officials, such as EU Vice President Frans Timmermans who recently declared that “The last thing” Europeans should do is “to change the nature of our open societies as a reaction to this threat. Because then we would play into the hands of these terrorists”. Related controversies have sprung up in the field of data collection and data retention. The ECJ decided last April (2014) to invalidate the 2006 Data Retention Directive. Some claimed that this decision was a clear obstacle to an efficient antiterrorist strategy. Reacting promptly after the Paris attacks, both UK Prime Minister David Cameron and Andrew Parker, the head of MI5, called for Britain's intelligence services to be given new powers to read the contents of citizens' communications, in order to avoid similar “mass casualty attacks” in the UK. The return of the Snooper's Charter to the political agenda comes as no surprise at all. What happened in Paris opened up a range of political opportunities for David Cameron and the conservatives generally: first of all, to blame, once again, EU courts of justice and defend, once more, British sovereignty. Also, it allows them to damp down the controversies that emerged after Snowden’s revelations and the delicate position of GCHQ in that affair. The coming weeks will show if this political opportunism is a credible one, Nick Clegg having declared that « the irony appears to be lost on some politicians who say in one breath that they will defend freedom of expression and then in the next advocate a huge encroachment on the freedom of all British citizens ». In France, the various declarations that have followed the attacks oscillate between the call for a French Patriot Act and more careful approaches. The first claim did not succeed, and is certainly not predominant in the responses that have been given by the French Government. Surveillance and early detection of radicalisation is of course an important component of the catalogue of measures presented by French Prime Minister Manuel Valls on January 21, along with an increase in the budget and human resources for law enforcement services. Additionally, a new set of surveillance laws will be presented to French MPs at the beginning of March. If this demonstrates once more how the attacks have been an efficient accelerator for renewed counterterrorism measures, a noticeable emphasis has simultaneously been raised on the need to frame these measures properly and ensure legal safeguards and more scrutiny. However, little can be said before the actual draft law is there to discuss. Whatever measures will be adopted at the French or at the European level beyond the “announcement effect”, our responsibility is to critically engage with them. Past experiences and lessons learned should enlighten us. It is our role, as citizens, to scrutinise measures taken in the name of our security and ask, once and for all, for evidenced-based policies. The days that have followed the Paris attacks have triggered a wide array of expert discourses on issues as diverse and complex as ‘djihadism’, radicalisation, conflicts in the Middle East, crime, border controls, the French banlieues, social integration of Muslim populations in Europe, etc. Altogether, these discourses provide very few explanations of what we are actually facing. One can linger indefinitely on building up the multifaceted enemy, but perhaps it is time, in a reflexive manner, to question counterterrorism measures, their nature, their technical components, the devices they instigate in our mindset. Common sense deserves here to be given a shake. Counterterrorism measures do not ‘naturally’ adjust to threats and fears; and they do have performative effects. There are no such things as depoliticised antiterrorism strategies. Furthermore, counterterrorism measures exacerbate the problems they are supposed to solve. The features of counterterrorism as we have experienced it in the last decades have contributed to fuelling the very process of mimetic rivalry described by René Girard. By antagonising certain positions, the process of mimetic rivalry precisely exalts the radical difference and an “escalation to extremes”, which, in turn, produces attitudes and behaviours far more similar than the actors involved dare to admit. For many years, the sociology of conflicts has offered different perspectives calling for a much more cautious approach, including vis à vis the facade of unanimity that too often polarises positions, leading to an escalation of violence and dismissing third parties. This has shown us that antiterrorism is part of the relationship to terrorism, and that respect for the rule of law and the democratic contract is an effective barrier against an escalation of violence. Breaches in this social contract already appear in the basket of measures proposed in the aftermath of the Paris attack, at the French but also more generally at the European and the transatlantic level. Highly counter-productive consequences can already be anticipated. Can emergency measures and the enlargement of suspicion effectively tackle political violence worldwide and provide more security? Is an ever greater surveillance the ultimate solution? The call for stronger and tighter surveillance by intelligence services does not only involve a trivial inconvenience for those who have nothing to fear from law enforcement. Surveillance also produces its own victims, as ten years of the war on terror have amply demonstrated. 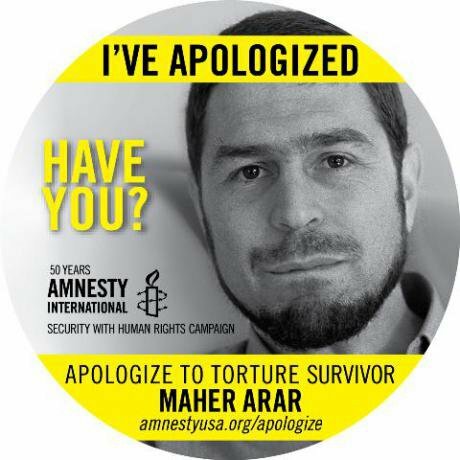 Maher Arar Amnesty campaign. Wikicommons. Some rights reserved.Investigations have finally uncovered, for instance, how a vast number of detainees in Guantanamo were in fact innocent. Many of the detention orders were based on false allegations, presumed connections, rumours and hearsay. Furthermore, the US Senate Report led by Dianne Feinstein on CIA torture released last December has shown that CIA investigation techniques (harsh interrogations, inhumane treatments and torture) have proved inefficient in the production of useful intelligence and fighting terrorism. Investigations into CIA Renditions also highlighted international complicities in the detention and handling of CIA suspects, leading to severe miscarriage of justice. Al Rawi, Binyam Mohammed in the UK, Maher Arar in Canada, Abu Omar in Italy, Ahmed Agiza or Muhammad al-Zery in Sweden, to name but a few, are no less than victims of the war on terror. They are, above all, the victims of surveillance techniques that have demonstrated their limits. In 2007, the House of Lords received evidence, some of it conflicting, on the accuracy and reliability of passenger name record (PNR) data. Evidence has shown collateral damage caused by data processing within the PNR database. Here, the above-mentioned case of Maher Arar, a Canadian of Syrian origin who spent almost a year in a Syrian prison cell owing to false conclusions drawn from correct PNR data by US and Canadian enforcement authorities is emblematic. Furthermore, evidence on direct hits achieved by PNR processing is extremely thin. As the House of Lords report reminds us, most of the controversy surrounding PNR data is about the use to which they are put, and the problems that arise in data profiling and data mining, which aim at detecting, with advanced algorithms, characteristics or combinations of characteristics which might identify someone or something as being potentially worth investigation. As repeatedly reported by experts in the field of big data, large volumes of data not only cannot identify potential terrorist plots, but also greatly increase the possibility of false positives and negatives. Are we really made to believe that an EU PNR and the surveillance of online communications will overcome terrorism? These type of measures, presented as ultimate solutions, precisely contradict, despite its ambiguities and ambivalence, the spirit originally conveyed by ‘Je suis Charlie’. Ten years of war on terror have shown its limits, its inefficiency, and its counterproductive effects. Enlarged suspicion only increases the risk of deceptive watchlists, of judicial errors as well as the breakdown of social cohesion and democratic laws. Generalised suspicion that always goes after the ‘folk devils’ clearly cannot be the Holy Grail. Instead, fewer laws, fewer algorithms, fewer predictive logics, but better assessments of existing laws, more scrutiny, strengthened oversight of police operations and investigative techniques, are urgently needed. Antiterrorism policies fully compatible with civil liberties and fundamental freedom indeed constitute a difficult political choice in the current environment that has led to these heights of securitisation. It is however a democratic need and a pathway to more security.